A comprehensive summary of research work related to applications of NMR spectroscopy in combination with multivariate statistical analysis techniques for the analysis, quality control, and authentication of wine is presented. NMR spectroscopy is used to obtain the non-volatile metabolic profile and/or phenolic profile of wines, with the help of 2D NMR spectroscopy. Metabolomics is then used as an analytical tool to investigate the variability of the metabolic profile of wines due to a series of different factors involved during wine production, including terroir, pedoclimatic conditions, vintage, vineyard practices, wine-making, barrel maturation, and aging. The discriminating power of the NMR-obtained wine metabolome is utilized as a wholistic analytical approach in efforts to authenticate wine with respect to important economic attributes, such as cultivar, vintage, and geographical origin. In recent years, NMR spectroscopy has found increased application in food science and agriculture, including the quality control , authentication , and analysis of an immense variety of food products [3–5]. Wine is an important commodity with a high added value, not only from a historical, but also from an economic point of view, especially for wine-producing countries, and thus a great deal of research has been devoted in NMR applications in wine analysis [6–8]. The main advantage of NMR spectroscopy is that it offers a facile and rapid way to obtain the chemical composition of grapes, grape juice, must, and wine, and identify a large variety of minor organic compounds (metabolite profiling), including amino acids , organic acids and alcohols [10, 11], sugars, and phenolic compounds . The suitability of NMR analysis as a methodology for the quantitative determination of wine components was recently demonstrated in an international collaborative trial . In fact, the whole NMR spectrum of a wine sample can be considered as a molecular fingerprint, and as such it can be used directly for comparison and identification purposes in metabolite fingerprinting of different wines. This chemical compositional/spectroscopic information constitutes the so-called wine metabolome, which is affected by a multitude of wine-making factors, including agronomic practices and pedoclimatic conditions , grape variety , fermentation practices , and geographical origin , and can be used for quality control and authentication purposes. For example, the ability to study geographical origin-related NMR metabolic effects is of extreme importance, since the high added value of wines is obtained from enforcing protected denomination of origin (PDO) and protected geographical indication (PGI) state regulations to control the appellation of wines [2, 5]. Fully automated 1H NMR-based metabolomic products for wine quality control and authentication have been developed and marketed successfully . The rich and complex mole of compositional information revealed by wine metabolomic profiles based on NMR spectra may be unraveled by applying suitable multivariate statistical analyses. In fact, by evaluating a large dataset of NMR spectra, the latter ones are capable of identifying correlations between metabolites and factors (e.g. terroir, vintage, etc.) potentially responsible for a specific metabolomic response as well as classify wines according to these factors [3, 19]. The multivariate statistical analysis models usually applied in wine NMR-based metabolomics are principal component analysis (PCA), partial least squares (PLS), orthogonal projection to latent structures (OPLS), and discriminant analysis (DA). Usually, unsupervised models such as PCA are initially used to obtain an overview of the metabolic variance of a complex NMR dataset, followed by more advanced supervised models (OPLS, OPLS-DA) which are characterized by a stronger discriminatory power. 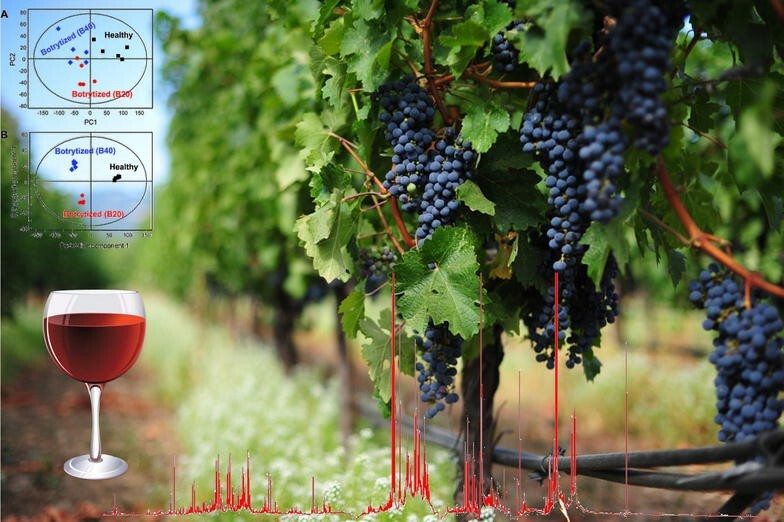 The ability to follow metabolome changes from the early stages of wine production provides the opportunity to use NMR-based metabolomics as a wholistic approach to obtain information on all aspects of the wine-making procedure, following the product from the vineyard to the bottle. Research efforts aimed toward this direction will be described in detail in the following sections. Although the first application of NMR spectroscopy in wine analysis involved the determination of ethanol content , this was soon followed by attempts to discriminate and characterize the minor organic compounds present in wines at smaller concentrations . The most intense peaks in 1H NMR spectra of wines correspond to water and ethanol, being these compounds the main components of wine. NMR spectroscopy can be used effectively for the determination of the ethanol content in wine . Conversely, when the focus is on the minor components of wine, water and ethanol signals must be eliminated spectroscopically, and this can be afforded via a variety of multiple suppression NMR techniques [9, 23]. Wine samples are also usually preconcentrated using freeze drying or an inert gas flow (nitrogen, argon) to physically remove water/ethanol, thus enhancing the detection of weak proton NMR signals of the minor compounds that are present in wine, and facilitating their identification. The merits of different preconcentration methods have been thoroughly discussed by Amaral et al. , while Ref. provides an overview of the pros and cons of wine sample preparation methodologies (see Chapter 8). Figure 1 presents some typical 1H NMR spectra of freeze-dried Port wine samples of different age and the more prominent compounds identified in them. The predominant components of wines as determined by NMR spectroscopy were organic acids and diols (tartaric acid, succinic acid, acetic acid, glycerol, 2,3-butanediol, lactic acid), amino acids (proline, alanine, arginine), carbohydrates (glucose, fructose), and polyphenols (gallic acid, 2-phenylethanol, tyrosol). Table 1 presents the major organic compounds most usually identified in wine and their 1H and 13C NMR chemical shifts . Frequently, studies of wine also deal with the analysis of grape juice and must samples, in order to elucidate the biochemical and chemical transformations taking place during wine production. As an example, Fig. 2 presents the 1H NMR spectra of must and wine obtained from cv. Tempranillo (Vitis vinifera) grapes from the Rioja region in northern Spain, indicating the differences between must and wine in the organic acid, carbohydrate, and aromatic NMR spectral regions. In particular, it shows that the presence of carbohydrates in wine spectrum was negligible as compared to the must, because of the saccharidic conversion occurred during must fermentation. Both homonuclear and heteronuclear 2D NMR spectroscopy techniques have been used to assist and verify the assignment of minor organic compounds found in wine . Figure 3 presents the aliphatic region of the homonuclear 1H–1H TOCSY 2D NMR spectrum of a French Cabernet Sauvignon wine . This type of 2D NMR spectrum yields information regarding correlations via 1H through bond spin–spin J couplings and is useful in identifying complete proton spin systems in organic molecules. Heteronuclear 1H–13C HSQC and HMBC 2D NMR spectra have also been used for the assignment of the organic compounds in wine samples . 13C NMR spectroscopy has also been used for the identification and quantification of organic compounds in wine . Holland et al. used 13C NMR in order to measure the concentration of amino acids in European wines. Colombo et al. used quantitative 13C nuclear magnetic resonance spectroscopy (qNMR) for the quantification of fructose and ethanol in wines using as an external reference the 13C qNMR spectrum of a sample of known concentration. 13C NMR was also used to examine the metabolic pathway transformations of amino acids during the alcoholic fermentation, since amino acids have an important contribution to the organoleptic characteristics and quality of wines . Solid-state 13C Cross Polarization–Magic Angle Spinning (CP–MAS) NMR spectroscopy has been applied, in combination with 1D and 2D solution-state NMR, for the analysis of the precipitates of Merlot and Cabernet Sauvignon red wines from the Bordeaux region. Figure 4 depicts the 13C CP–MAS NMR spectra of precipitates of red wines after aging in oak barrels. Organic acid carbons appear in the region between 0–50 ppm (aliphatic) and 170–180 ppm (carbonyl groups), polyphenolic carbons between 90 and 140 ppm, and glycerol slightly above 60 ppm, while the 65–90 ppm region is dominated by characteristic carbon contributions from sugar moieties in polysaccharides . Finally, it is worth noting that NMR spectroscopy has also been used to measure the content of acetic acid and detect oxidative wine spoilage by the direct analysis of intact wine bottles, without any sample pretreatment [33, 34]. There is a great interest in the determination of phenolic compounds found in wine because of their significant role on the organoleptic and sensory characteristics of wines. Polyphenols include phenolic acids, flavanols, stilbenoids, dihydroflavonols, flavanol monomers (catechins), flavanol polymers (proanthocyanidins), and anthocyanins. Since polyphenols are present in very low concentrations in wine, a chromatographic preconcentration step is usually necessary for adequate analysis. 1H NMR and HPLC were used for the determination of the phenolic fraction of Greek wines using adsorption resin XAD-4, in order to concentrate them . The phenolic compounds that were identified were gallic acid, syringic acid, p-coumaric acid, trans-caffeic acid, (+)-catechin, (−)-epicatechin, ferulic acid, quercetin, kaempferol, and trans-resveratrol. Figure 5 shows the aromatic region of the 1H NMR spectra of Mandilaria and Agiorgitiko wines and the assignment of the phenolic compounds . In another study, two types of German white wines from the Palatinate region were analyzed by extraction with ethyl acetate and addition of Na2SO4 to remove the residual water. Using this method, it was possible to identify in wine not only amino acids, carbohydrates, and organic acids, but also phenolic compounds . Anthocyanins, which are responsible for the red color of wines, were analyzed by 1D and 2D NMR spectroscopy in Slovenian wine samples diluted in deuterated methanol, and the anthocyanins that have been identified were peonidin-3-glucoside, petunidin-3-glucoside, cyanidin-3-glucoside, delphinidin-3-glucoside, and malvidin-3-glucoside . Fourier transform near-infrared and 1H NMR spectroscopy techniques combined with classification methods were used for the authentication of anthocyanin content of red wines, in an effort to detect possible adulteration with black rice anthocyanins . By the combination of NMR and LC–MS, the identification of anthocyanins in Pinot Noir, Cabernet Sauvignon, and Merlot red wines produced in Slovenia was obtained . High-performance liquid chromatography coupled with mass spectrometry (LC–MS) and NMR spectrometry (LC–NMR) were used to analyze the composition of anthocyanins of grape berry skins belonging to four different grape varieties . Hyphenated chromatographic/spectroscopic techniques such as LC–NMR/MS were also used for the analysis of the aromatic composition of wine phenolic extracts, with their combination being able to provide more information on the aromatic profile of the wines than standalone methodologies . The chemical structure of tannins, which are considered responsible for the astringency of wines and have a key role in red wine flavors, was studied using chromatographic methods, NMR spectroscopy, and mass spectroscopy . NMR-based metabolomics has been used extensively to study wine fermentation and evaluate the fermentative characteristics of different yeast strains. Son et al. evaluated three Saccharomyces cerevisiae yeast strains (RC-212, KIV-1116, and KUBY-501) for their impact on the metabolic changes in must and wine during fermentation. 1H NMR spectroscopy has also been used to investigate the fermentation of Romanian wines with Saccharomyces cerevisiae yeast under different conditions: natural fermentation (without additional yeast), induced fermentation using different amounts of selected yeasts, and industrial fermentation . 1H NMR metabolomics was used to successfully differentiate “fiano di Avellino” white wines obtained by fermentation with either a commercial or a selected autochthonous Saccharomyces cerevisiae yeast starter . Figure 6 depicts the respective PCA score plot for yeast differentiation, with variance between the two yeasts afforded by higher concentrations of α-glucose and fructose in the autochthonous yeast, while glycerol and succinic acid were positively correlated with the commercial one. Lee et al. used a combination of 1H NMR and gas chromatography metabolite profiling in order to study the fermentative behavior of lactic acid bacteria in grape wines. Quantitative NMR was also used to study the changes in malic and lactic acid concentrations that take place during the alcoholic and malolactic fermentation process . Baiano et al. examined the effect of four different wine-making technologies (traditional white vinification, skin cryomaceration, vinification in a reductive environment, and a combination of the last two procedures) on the metabolite profile of Sauvignon blanc wines, reporting strong changes in organic acid concentrations (mainly tartaric acid) and phenolic content. Negroamaro red wines obtained through different wine-making technologies (traditional, ultrasounds, and cryomaceration with dry ice) and two soil management practices (soil tillage and cover crop) were analyzed by 1H NMR metabolomics and were discriminated using both supervised (OPLS-DA) and unsupervised (PCA) multivariate models . 1H NMR spectroscopy with PCA analysis was used to study Cabernet Sauvignon wine samples produced with different cultivation techniques and provided information by connecting technological procedures with the composition changes in wine . Recently, Picone et al. showed that the biodynamic and the organic cultivation managements produce grape berries (V. vinifera L. cv. Sangiovese) that can be differentiated using 1H NMR-based metabolomics. López-Rituerto et al. investigated the La Rioja wine terroir using 1H NMR metabolomics of must and wine samples obtained from different wineries located in this area of central Spain, reporting that the aliphatic alcohols isopentanol and isobutanol were key biomarkers for differentiating wineries located very close geographically. 1H NMR metabolomics has also been used to characterize the terroir effect on the quality of Aglianico red wines from the Campania region of Italy . Multivariate analysis of the NMR metabolite data demonstrated that the differentiation observed among wines produced from three different vineyards was related to microclimate and the carbonate, clay, and organic matter content of soils. In a study of wines produced in the Bordeaux region in France, Pereira et al. showed that the NMR metabolic profile of wines was affected within a given wine cultivar by soil type (gravely, sandy, or clay), but vintage and cultivar effects were more dominant. Da Silva Neto et al. used 1H NMR metabolomics to characterize the metabolic profile of “tropical” wines produced in the region of São Francisco River Valley in northeast Brazil, aiming to compare tropical wines to those produced in more temperate wine-producing zones in Brazil. Some other agronomical factors that have been studied include the effect of grape maturity and health on wine quality. Chang et al. studied the effect of harvest time on the quality and metabolite composition of wines obtained from grapevine cv. ‘Cheongsoo’ using 1H NMR metabolomics. It was reported that certain metabolites (proline and arginine) that varied with harvest time were closely associated with the body and balance scores of the wines on sensory tests, and concluded that NMR metabolomics can be used to optimize wine quality by identifying metabolites correlated with positive wine sensory attributes. Hong et al. studied the metabolic effect of Botrytis infection in Champagne base wine using a 1H NMR-based metabolomic approach. PCA analysis of the NMR-obtained metabolite data indicated that Botrytis infection of grape caused fermentative retardation during alcoholic fermentation leading to wines of inferior quality. Figure 7 presents PCA (A) and OPLS-DA (B) score plots of healthy and botrytized base wines indicating the correct classification of healthy wines and wines infected by Botrytis cinerea (20 and 40% of infection). 1H NMR spectroscopy combined with multivariate statistical analysis has been applied successfully for the classification of different wine cultivars, usually involving the study of wines produced from the same geographical region, in order to exclude site-specific effects capable of affecting the wine metabolome. Godelmann et al. analyzed different wine varieties that were produced in Germany using 1H NMR spectroscopy with multivariate data analysis, including PCA, Linear Discrimination Analysis (LDA), and Multivariate analysis of variance (MANOVA). The grape varieties Pinot Noir, Lemberger, Pinot blanc/Pinot gris, Müller-Thurgau, Riesling, and Gewürztraminer were successfully classified, and it was reported that the organic compounds mainly responsible for the observed differentiation of the wine varieties were shikimic acid, caftaric acid, and 2,3-butanediol. In another report, the characterization of Müller-Thurgau and Riesling white cultivars was performed using NMR spectroscopy and orthogonal projections to latent structures (OPLS) statistical analysis methods. Riesling wines were found to have higher levels of catechin, caftarate, valine, proline, malate, and citrate, whereas Müller-Thurgau wines had higher concentrations of quercetin, resveratrol, gallate, leucine, threonine, succinate, and lactate . Wines from the cultivars Agiorgitiko, Mandilaria (red), Moschofilero, and Assyrtiko (white) produced in Greece , and Cabernet Sauvignon, Merlot, Feteasca Neagra, Pinot Noir, and Mamaia wines, produced in Romania , showed also successful cultivar discrimination using NMR-based metabolomics. Cabernet Sauvignon and Shiraz wines, produced in Australia, showed a clear separation based on their respective metabolite profiles. Cabernet Sauvignon had higher levels of proline, while Shiraz wines had higher levels of sugars (fructose and glucose), succinate, methanol, acetate, and some aliphatic amino acids . Son et al. used 1H NMR spectroscopy coupled with multivariate statistical data analysis (PCA, OPLS-DA) in order to characterize wines from different grape varieties cultivated in South Korea. Figure 8 presents the PCA score plot of the four grape varieties (Muscat Bailey, Campbell Early, Kyoho, and Meoru), demonstrating the clear separation between different wines as a function of the cultivar. Hu et al. examined the influence of grape genotype on the 1H NMR metabolic profile of wines by studying five variously genetically related grapevine (V. vinifera) cultivars. It was concluded that genetic differences in grapes are reflected in the composition of related wines which, in turn, can be discriminated by NMR-based metabolomics, and thus the study of single grape cultivars may prove useful in elucidating the genetic lineage of mixed grapevine cultivars. The analysis of wine blends obtained from binary mixtures of a wines using NMR spectroscopy in combination with linear classification models (LDA) and neural networks has also been reported . NMR-based metabolomics has been extensively used for the classification of wine samples according to their geographical origin, and several studies have shown a clear differentiation among wine samples produced by grapes belonging to the same cultivar but harvested in different regions of the same country. Muscat Bailey variety wines produced in three different regions in South Korea , German wines produced in different regions , and red and white wine varieties harvested in Apulia (southern Italy) and Slovenia  showed a clear differentiation according to the area of production using NMR-based metabolomics. Son et al. classified Cabernet Sauvignon wines harvested in California, France, and Australia using 1H NMR spectroscopy and multivariate statistical analysis. Figure 9 depicts the respective PLS-DA score plot, which shows a clear separation between wine samples originated from the three different countries. Pereira et al. investigated mature grape berries produced in four different regions in Bordeaux (France) and showed that NMR spectroscopy and chemometrics can classify the berries according to their area of production. In another study, commercial wines of Greco Bianco grape variety produced in the Italian regions of Calabria and Campania were investigated using chromatographic methods and NMR spectroscopy. PLS-DA models of the obtained metabolomic data showed good differentiation of the wine samples according to their geographical origin, with total acidity, citric acid, malic acid, succinic acid, lactic acid, total polyphenol index, glucose, and proline/arginine ratio being the main contributors to the classification of the wine samples . For the investigation of the geographical origin of wines, NMR spectroscopy and Isotopic Ratio Mass Spectrometry (IRMS) have also been used, and a deuterium natural abundance quantitative NMR method (SNIF-NMR: Site-specific Natural Isotope Fractionation) to characterize the chemical origin of wine metabolites was developed . Finally, in a recent study, multivariate PCA–DA analyses applied on the combination of NMR and SPME–GC data was used to classify white wine samples from Galicia (NW Spain) according to both varietal and geographical subzones of origin. The results indicated an increased discriminatory extent deriving from the combination of different analytical methodologies in metabolomic studies . Wine quality is strongly dependent on the vineyard climatic conditions, so vintage is important for the assessment of metabolite profile information obtained from wine samples analyzed by NMR spectroscopy. Macro- and microclimate year-dependent changes can affect the chemical composition of grapes and conversely the metabolite profile of the wines produced. Furthermore, grape cultivars may respond differently to yearly variations in climatic conditions (rainfall, average temperatures, etc. ), while small alterations in wine-making practices may also contribute to metabolite profile variations of different vintages. Several publications utilizing multivariate statistical analysis combined with NMR spectroscopy showed differences in the metabolite profiles of wine samples according to the vintage year. Amarone wine produced in Italy showed a clear separation among three different years of harvesting (2005, 2006, 2007) using 1H NMR spectroscopy with PCA and partial least squares discriminant analysis (PLS-DA). The organic compounds that were responsible for the classification of the wine samples according to vintage were mainly amino acids, sugars, and aromatic compounds . Meoru  and Chengsoo  wines were also classified according to the vintage year. Figure 10 presents the PCA score (A) and loading (B) plots of Meoru wines harvested in 2006 and 2007. There is a clear separation between the two vinification periods and the loading plot (B) shows that this classification is based on differences in lactic acid, γ-aminobutyric acid (GABA), and proline . In another study, white wines produced in 2006 and 2007 showed discrimination using NMR metabolomics, with wines produced in 2006 having higher levels of leucine, phenylalanine, citrate, malate, and phenolics, compared to wines that were produced in 2007, and possessed higher levels of proline, alanine, and succinate . Greek wines Agiorgitiko (red) and Assyrtiko (white) harvested in two different vinification years (2005, 2006) were classified according to vintage by analyzing NMR spectroscopic data with multivariate PLS-DA models . 1H NMR spectroscopy combined with multivariate statistical analysis showed classification of two vintages (2008 and 2009) of wines produced in Germany from different grape varieties, by different enological technologies and from different producing areas . 1H and 13C NMR spectroscopy techniques were also used for the analysis of young and aged Romanian red wines (vintages from 2009 to 2014), demonstrating that NMR metabolite profiles combined with multivariate statistical analysis are able to classify these wines according to the different vintage years . The brief summary of the research efforts described in the present article should be convincing evidence of the ability of NMR spectroscopy metabolite profiling, assisted by multivariate statistical analysis modeling, to shed light on the various factors that affect the quality of wine and help establish analytical protocols for the authentication of cultivar, vintage, and geographical origin of wines. Wine quality and authenticity is not only of great economic importance for wine producers, but also significant for building consumer confidence in this high-added-value product. The general picture emerging so far indicates that wine-making procedures and cultivar are factors more strongly reflected in the non-volatile wine NMR metabolome, followed by vintage and geographic origin. The latter factors would benefit from a deeper understanding of the part of the wine metabolome related to minor components (e.g. phenolics, volatiles), which is more strongly affected by ever-changing pedoclimatic conditions contributing to vintage and geographic origin molecular fingerprints. Further development in the field of NMR-based wine metabolomics will benefit from better systematization of wine studies with respect to sample preparation and analysis protocols and multivariate statistical analysis modeling protocols. This will help the creation of wine metabolic profiling databases that would be continuously updated, and thus could be used in wine quality and authentication applications. Furthermore, the combination of the chemical–analytical profiling capabilities of NMR spectroscopy with other analytical methodologies (LC–MS, GC–MS, etc. ), able to sample different parts of the wine’s total metabolome (volatiles, phenolics, tannins, aroma compounds, etc. ), will undoubtedly become more common in the future. The efficient application of chemometrics to analytical data deriving from advanced techniques will serve as a wholistic method to characterize and investigate on wine production, quality, and authentication, thus permitting to monitor this product from the vineyard to the cellar. The authors contributed equally to this manuscript. Both authors read and approved the final manuscript. This research has been co-financed by the European Union (European Social Fund—ESF) and Greek national funds through the Operational Programme “Education and Lifelong Learning” of the National Strategic Reference Framework (NSRF)—Research Funding Programme: THALES (MIS 377213). Investing in knowledge society through the European Social Fund.